Exclusive! Give your BFF a gift she will treasure for a lifetime! 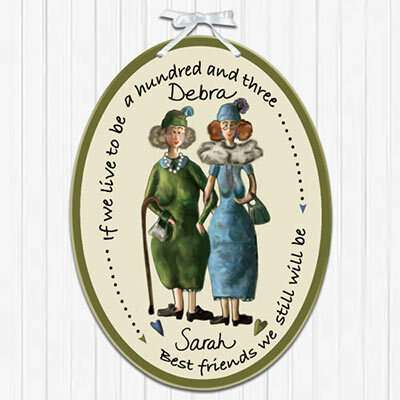 Our beautiful painted ceramic Personalized Best Friends Plaque features a handwritten personalization that lets them know they are truly one of a kind. Includes satin ribbon for hanging. Imported. 8"h. Specify two names up to 12 characters each. Place order by December 10th to ensure Christmas delivery.